The highlight for many team players was the close five-set victory over Harvard University earlier this season. Dartmouth is led by head coach Gilad Doron, who is in his third season as the team’s head coach. Doron noted that while the team has certainly had some huge successes this season, there’s still a lot more work to be done. Doron’s point about the youth of the team is a big one. The team only has two seniors, but fortunately, the freshman class has had a monumental impact. Francesca Meldrum ’22 currently leads the team with a .360 hitting percentage and 54 blocks. Nicole Liddle ’22 leads the team with 122 kills and is fourth with 108 digs. “[Liddle] just got back from an injury, but [when healthy], she’s been a steady presence for us all year long,” Meldrum said. Liddle is one of many key players to miss time, which has been a major issue for Dartmouth this season. Captain Zoe Leonard ’19 was one of three starters who was injured for Dartmouth’s New York road trip at Cornell and Columbia. Losing Leonard for that road trip was a big blow for the team because of her productivity and leadership on the court. “Zoe is great at keeping everyone calm on the court and on top of everything,” Meldrum said. Despite missing time, Leonard still leads the team by far with 185 digs as the team’s libero. Without Leonard, Dartmouth dropped its match at Columbia in four sets and was swept by the Big Red in three sets. On the flip side, Dartmouth has already picked up some critical Ivy League wins. The most notable was its five-set win over third-ranked Harvard, which was close throughout the match and came down to the last set, which Dartmouth won 17-15. “The Harvard game had a great atmosphere and the team played with tons of emotion,” Doron said. He commended the team for fighting relentlessly throughout the game in spite of losing a starter to injury. “It’s the first time in my two-and-a-half years here that a team fought until the end and found a different way to win not just based on the scouting report,” he added. Bella Hedley ’22, who leads the team with 15 service aces, sensed that winning the Harvard game was incredibly meaningful to her older teammates. “A lot of upperclassmen were saying that was the most exciting game they’d ever experienced in all their years here,” Hedley said. The Harvard victory was followed by the tough road trip in New York and a three-set home loss to Princeton University, but the Big Green have bounced back since. They have won two of their last three matches, defeating the University of Pennsylvania at home in three straight sets, dropping the match against Yale University in three and knocking off Brown University in four sets. So far, the Big Green are 4-2 at home, with non-league wins over Siena College and Lafayette College in addition to victories against Harvard and Penn. Doron attributes a lot of this home-court success to the positive atmosphere at Leede Arena. “In the game against Harvard, it was a great help to have the student section standing and cheering and staying for the whole match,” Doron said. Looking ahead to the second half of the season, four of Dartmouth’s final seven matches to round out Ivy League play are at home. “If we can fill out the gym here a couple of times, we can have a great home-court advantage against any team we play,” Doron said. With a lot of home matches on tap and key players back having returned from injury, the Big Green are equipped to finish the season strong. Hedley is specifically focused on getting revenge against the New York programs that handed the Big Green defeats earlier in the season. 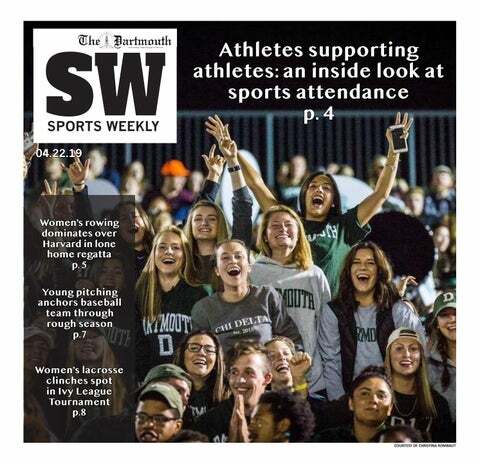 Dartmouth’s next match is on Friday night at Harvard. Winning this game in Cambridge would be critical because, as Doron noted, it would be the first time Dartmouth ever swept Harvard in a season. Hopes are high for the second half of the season and for the next few years as the young Big Green continue to improve.